Check out our 78 5 star reviews on our Vacation Studio downstairs #3767864 ! 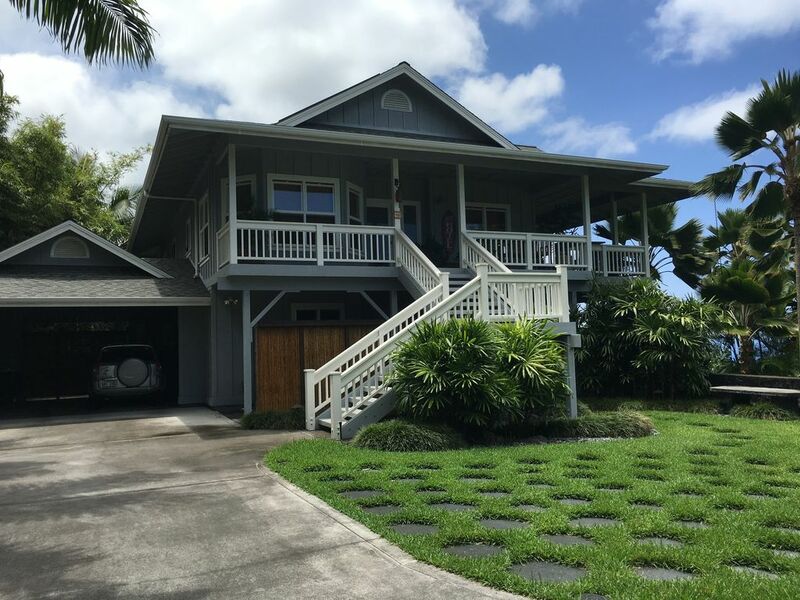 Centrally located in North Kona, this house is 15 minutes from the airport, downtown and sandy beaches. It is situated at a cool 1000 foot elevation, and is located in a traditional Hawaiian neighborhood with large lots, mature trees and no street lights. Colleen and Gary moved to the Big Island in the early 70's and are still here. We hope you enjoy it as much as we have. This vacation rental is an absolute dream. We felt this the moment we stepped in, as the overwhelming sentiment might have been the dread of having to leave it at the end. It’s beautiful, comfortable, sturdy, practical and nicely laid out. And very clean. We had inquired about the lack of air conditioning, but none was required as it never got hot in the house : we always slept with the windows shut, and the ceiling fan was always sufficient to keep the room to proper sleeping temperature. The friendly owners make available a bunch of stuff, like beach chairs and towels (that we used), as well as boogie boards and coolers (a nice touch). As for location, well, it was perfect for us: in the cool hills of Hualalai, but a short distance to town and services. Anything negative to say? Well, no. Be aware though the BBQ grill is of the classic charcoal type, somewhat less practical then the gas type. So a great vacation for us, in good part because of this fantastic house. Thanks to Coleen and Gary. Thank-you Pierre for your lovely review. Enjoyed hosting you and your wife. Had everything you needed in the kitchen, baths, and rooms. Beautiful view on the balcony overlooking Kona seeing the amazing sunset and sunrise. Very peaceful, great place for relaxation. Very Clean and organized. Variety of DVDs, books and other entertainment options were provided. Thank-you Ivan and Titianana, for the lovely review . Thank-you for taking such good care of my home. We very much enjoyed out stay at Colleen and Gary's top level of their guest house. We enjoyed the lanai with sweeping views down to the ocean, large kitchen, laundry facilities, extremely comfortable beds, and Hawaiian, tropical tranquility. It's within striking distance of the beautiful beaches north of the airport as well as easy access into Kona and grocery stores. Not having to deal with traffic lights out of Kona to go other places really added to the relaxation of our mornings and returns home. We shared the space with another couple and there was plenty of room for everyone. My only feedback for the owners would be to kindly include a few more 'essentials' like sugar, oil, and conditioner, and perhaps extend the checkout time from 10am to 11am to take some stress off guests in closing out their stay in a more relaxed manner. Thank-you for your input. I'm glad you enjoyed your stay and the Big Island. We changed our check out time from 11 to 10 due to the amount of time it takes me to prepare the house for in coming guest. Usually takes me a day and half. I take extreme pride in presenting the house to all my guest. Thank-you Gordon, hope you made it home. Thank-you for leaving the place in excellent condition! Loved it. Wish we could have stayed longer! Beautiful custom built super clean home, lovely ocean view deck, finely decorated, well stocked kitchen, basically included everything to satisfy your needs. Enjoyed the fresh fruit and cold refreshments! Owners were welcoming and helpful with Island tips and suggestions. Will definitely recommend to friends and hope to stay again. Thank-you for staying with us, hope to see you next year! This home is beautiful, well maintained, very clean and in excellent condition. The house is very well laid out and beautifully decorated. The view from the lanai is excellent. Colleen and Gary are very welcoming as hosts. The next time we visit the big island we will stay here. Thank-you Mike for your lovely review. Hope to see on your next Big Island visit.